I know it’s not yet July 4th but registration starts this weekend for FaffCon 6 in San Antonio, TX October 4-6. 2013. Many of you know I volunteer as the Sponsorship Liaison for FaffCon which is a fancy term for Sponsorship Sales Guy. I like doing it mostly because of how important FaffCon is to my voice-over career. For those of you who want to know about FaffCon’s sponsorship opportunities, you can feel free to email me or call me and I’ll send you the info or you can check out the web site. In answer to your next question, yes sponsors get to register early (open registration begins on Saturday at noon ET, sponsors get to register Friday (6/28)) and yes, FaffCon WILL sell out very quickly (it was sold out in about 7 hours last time). I hope I get to see you there. So in my years of travel and voice-over meet-ups, I have never happened up a voice-over meet-up that was taking place when I happened to be in town. 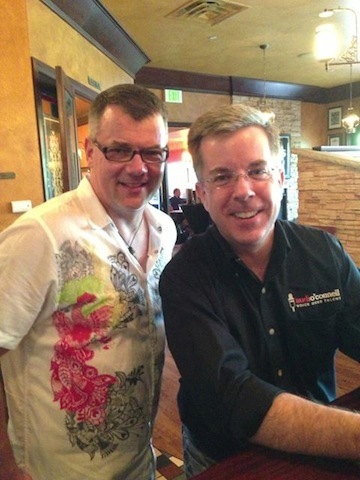 But when I contacted my friend and fellow voice-over talent Terry Daniel to let him know I was coming to Minneapolis to see if he wanted to get together, he said he was doing a voice-over meet-up group that night and invited me to tag along. It was a great night visiting with many established and newly ordained voice-over talents who were very welcoming and friendly. My thanks to Terry and everyone at the Twin Cities Voice-over Meet Up group who were so kind to me. In a recent Voice-Over Xtra! article, my friend and fellow voice-over talent had some great suggestions for how to make sure your voice-over business doesn’t breakdown like her 1997 Honda CR-V. Reviewing her checklist will probably cost you less than $3,500. It’s a good read from a smart lady. I know it sounds silly, but I still get surprised that people read my web site. Sure I know people visit the site, but when I talk to people that have read the site (cause there is a lot of stuff there), it’s a (pleasant) surprise. I say all this because I got a call a few weeks ago from Garnet Williams who told me all about…me. He’d read about me and the stuff I’d done and asked if I would be a guest on his voice-over podcast, The Amivos and Friends Super Funtastic Happy Hour Podcast. 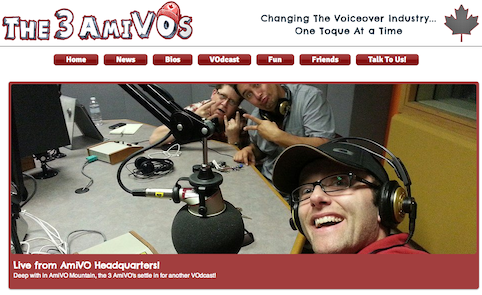 The ‘Amivos’ in the podcast (or VOdcast) refers to the 3 Amivos with include Garnet, Dave McRae and Mike Pongracz – all Canadian-based voice-over talents who decided to put together this show about voice talents. They were under the impression that I was to be their first American guest on the 4-show old program (as their very first guest in Episode 3 was the great narrator and VO in TO co-mastermind Patrick Sweeney) but alas, they found that I have Canadian blood in me, even though I was born in the States. So I am an Americanadian. The show was recorded while I was driving back from Pittsburgh, PA and I gotta tell you, that drive never went by so quickly. It was enormous fun because these guys clearly know how to run a great show and are fine interviewers. It reminded me about what was great about radio. We talked so much that they had to leave out the fun story about how I signed with Tanya and Darryl at Ta-Da Voiceworks while at FaffCon in Ventura Beach and how I met Tanya as well as VO in TO co-mastermind Jodi Krangle at a Deb Monroe Voice-over class some years ago in Toronto (see, I get to hang out with ALL the cool Canadian voice talents). With my sincere thanks to Dave, Mike and Garnet, I hope you’ll not only want to listen to the show that I’m on (ego? moi?!) but also check-out their past and future episodes. care to provide an honest answer? 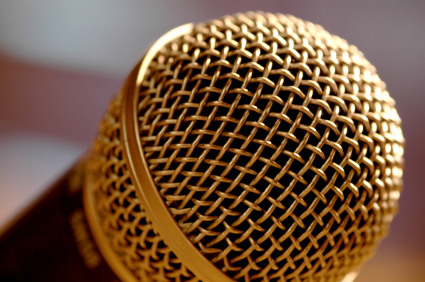 Have you ever turned down a voice-over job because you disagreed with its content, message or tone? If so, what was it and what about it made you turn it down, what about it made you say ‘this is not for me’? Looking back now, would you do anything differently? I am not asking about a hypothetical nor do I want to know about what you ‘might’ do or what your hot buttons are…I’m sure those are interesting points for another time. If you have an actual story, an example…I’d like to hear about it. Full disclosure: there is a benefit to being old and stupid. This evening when I was plowing through browser tabs, I had my Twitter screen up and in one of the small boxes on the screen filled with some suggestions of who I might want to connect with I saw a kind of artistic icon. I didn’t look at the name, I was just drawn to the icon, I wanted to see what it was. 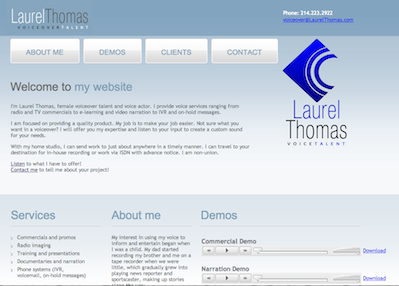 Turns out it was the Twitter page for a voice talent named Laurel Thomas. The name struck me as familiar but I didn’t think too much of it originally because I focused, I wanted to get a better look at that icon. Going to the web site, I loved not only the icon (which drew my eye initially) but the site itself which was laid out in a simple, tasteful design but most importantly was EXTREMELY easy to navigate. Thinking from a producer’s perspective who might happen upon this site, I thought wow, this would definitely allow a producer to get demos and information about this talent really easily. This is web site design at it’s best. Hopefully there is a great SEO plan associated with this as well but it’s worth pointing out social media (in this case, Twitter) did it’s job and it guided me to where I assume Laurel would like her Twitter followers to land at some point. Then I thought…how cool. This would be the first “My Favorite Voice-Over Websites!” website reviewed of someone I hadn’t met…except, this is where the old and stupid part comes in. Laurel’s a Faffer. I knew something about the name was familar, the voice rang a bell and then when I googled the image, not only did her pics come up but so did MY blog logo as Laurel had commented on a past post. Oy! I risk embarrassing myself here (well, there’s no ‘risk’ actually as I just DID embarrass myself) for the simple fact that not only is it a funny story to tell on myself but it highlights that producers can get scatter brained too….in spite of all your phone calls, direct mails and fancy business cards, they forget. It’s not at all personal…it’s information overload and we ALL suffer from it. So your branding and web site better be ready to catch a producer’s attention – like Laurel’s does.